Editor Note: Our take? If you’re triggered by the American Flag, get the hell out of America. We want to know what you think. Send us your thoughts in the form at the bottom of this article. In The People’s Republic of California, people who hate the very country they are blessed to live in are flipping out on the police again. This time it’s the American flag that’s triggered them into an absolute meltdown. Here’s the deal. 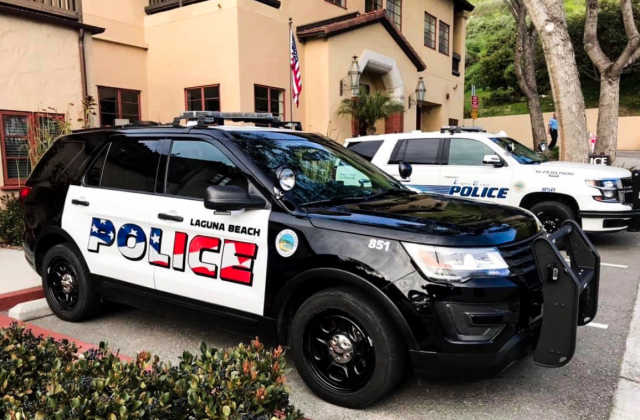 Laguna Beach police cars are now donning an American flag graphic. Why? Because, despite the efforts of Democrats in California to eliminate borders, this is still America. 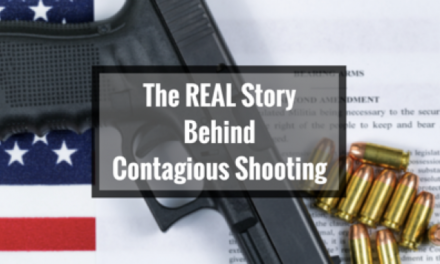 People who live in the community are up in arms and have said it’s “too aggressive”. 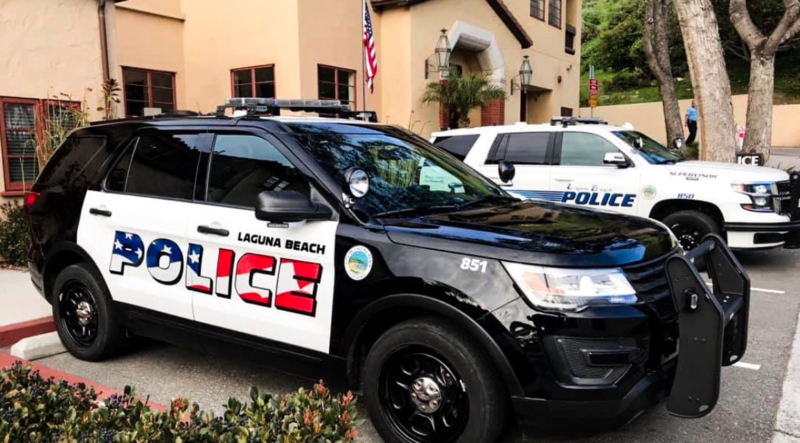 Now, in the interest of pandering to haters, officials have said they’re reconsidering the February decision to paint the Laguna Beach Police Department’s fleet of 11 squad cars. They’ll debate the decision again at its meeting this coming Tuesday. At the March 19 council meeting, a self-described “artist” named Carrie Woodburn addressed the council. She said it was “shocking to see the boldness of the design” when the newly painted Ford Explorers rolled out. Perhaps she could paint a picture of melting snowflakes that can be put up on the police department lobby? Attorney Jennifer Welsh Zeiter said at the last council meeting that she found the police cars “exceptional”. She went so far as to question the loyalty of anyone who objected to the American flag display. Back story: in February, the council agreed to repaint its all-white square cars in black and white. On them would be the image of the flag running through the word “police” on the doors. Ready for another story of triggering thanks to the “big, scary flag”? Local designer Chris Prelitz said he was dining with his wife at the Montage hotel. That’s when he claims every freaked out and parents and small children started running for their lives. Pure terror, apparently. “There was like a little panic going on, and I was like, ‘What’s happening?’ ” Prelitz said. That’s when he realized the horror. A couple of those police cars had arrived. He didn’t specify if the people scattering were legal or not. He also didn’t elaborate to local media on just how many tears of horror he shed during this life-threatening encounter. Laguna Beach Police Cpl. 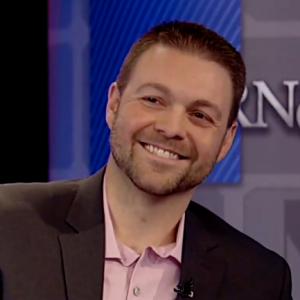 Ryan Hotchkiss is the president of the Laguna Beach Police Employees Association. He said he had received only positive feedback. Now it’s up to this meeting on Tuesday whether the council will allow the logo to stay or choose something less horrifying than a symbol of freedom and patriotism. Apparently the design now on the cars isn’t as “muted” as the version that was unanimously approved in February. Seven of the 11 vehicles have the design, according to police Sergeant Jim Cota. Police Chief Laura Farinella is all about them. At the Feb. 19 meeting, she said that black and white was more visible and distinguished police squad cars from other security vehicles. The Mayor agreed. 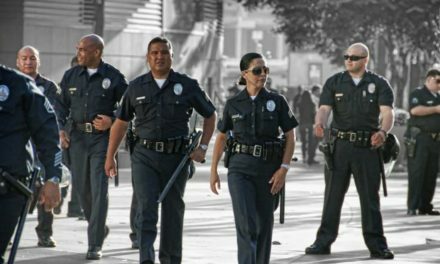 Last month, it was the words “In God We Trust” that triggered another meltdown over police cruisers. I was driving through Texas today and saw the words “In God We Trust” on a cruiser on the highway. I’m not sure if your company oversees police unions, but I figured I should start by reaching out to you. God is a fairytale. He doesn’t exist. Having these four words on the police means you can’t trust the police seriously, because they obviously perpetuate lies. It’s a clear violation of the separation of church and state. It’s offensive to me and because it’s offensive to me, it’s obviously offensive to others and it needs to be removed. It devalues the police. It devalues what they stand for. It shows they only protect people who also share their same warped beliefs. Please pass this along. 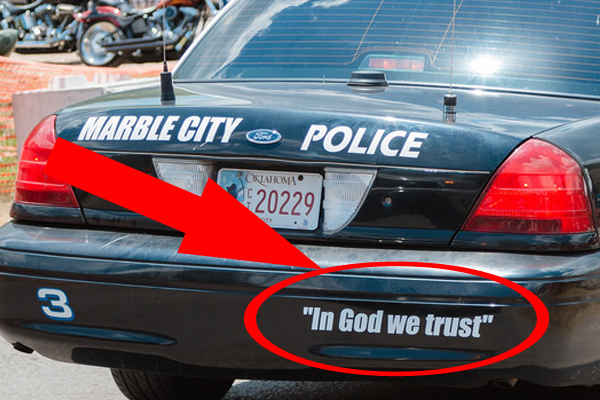 In God We Trust doesn’t belong on police cars. Well, I’ve got some words for Joe. I’m going to preface this by telling you I’m a proud Christian. I want to clear the air on that in advance. I’m of the belief that everything I have in life is because of God, who was so kind and merciful that He gave His only son for us. I pray daily, and I’ll be praying for you tonight. Now that we have that out of the way, I’m going to set aside my faith for a minute in hopes we can try and find some common ground. Because clearly that’s not going to happen on the God topic, and that’s ok – I believe that as a Christian, I’m called to be a fisher of men… not just a fisher of other fishermen. In 2015, Texas Attorney General Ken Paxton issued a legal opinion on the topic you wrote to us about. He said that police cars showing the motto in his state are not a violation of the First Amendment’s Establishment clause. The Freedom From Religion Foundation has been fighting the displays. Prior to Paxton’s statement, they’d already sent letters to more than 60 police departments around the country asking them to stop the practice of displaying “In God we trust”. Now let’s talk about your argument that it “devalues” police and means you can’t “trust” them. If I handed you cash, would you spit in my face? Would you tell me that my money was worthless? That the cash held no value? That you couldn’t trust it to make a purchase? Here’s the thing, Joe. In 1956, President Dwight Eisenhower signed Public Law 84-140, which was passed by Congress. It’s gone to court. And in 2014, the U.S. Court of Appeals for the Second Circuit, based in New York City, said that the use of the phrase “In God We Trust” on American currency was constitutionally permissible in the case of Newdow v. United States. Who brought that suit? Attorney Michael Newdow, on behalf of 11 atheists and humanists and two organizations. Newdow was made famous in 2002 when he won a ruling from the United States Court of Appeals for the Ninth Circuit (who anyone with a brain recognizes as the looney bin of courts) that struck the words “Under God” from the Pledge of Allegiance. The Supreme Court later overturned that insanity. Newdow failed miserably. The Second Circuit shot down his argument that the words violated the First Amendment’s Establishment and the Free Exercise clauses, as well as the Religious Freedom Restoration Act of 1993. Now Joe, listen, I get it. Words are scary. But in my experience, sometimes words are scary because they make us look deep into ourselves and we don’t like what we see. My guess is that you’re afraid of not just those words, and not just police, but the idea that by recognizing that God exists means you have to recognize that some things are just outside of our control. That’s how it is for police officers. While I’d never suggest they are all men and women of faith… I’d suggest that they’re willing to recognize that they do not have control over everything in this world. That their own safety and protection is sometimes not in their hands. Joe, I’ve been blessed to interview countless cops over the years. Through tears, Micah recounted the day he responded to a 9-1-1 call and found a young boy accidentally hanging in the shower on a Soap-On-A-Rope. The grandfather was crying desperately. It was the first time the boy’s parents had gone on a date in years… because his mom was terrified something bad would happen if they did. Danny told me about the body of the baby he found. He also shared the story about running into a burning building – as a police officer and without fire gear – to save the lives of children. Danny is a father. Brandon told me about the guy he caught on the way to kidnap, torture and murder his pregnant girlfriend. Jessie told me about the day a terrorist shot him at point blank range through his patrol car window while he sat at a red light. For so many… it’s all too easy to allow the darkness in the world to take over. But we need to remember that those who hold the Thin Blue Line are those who fight to keep that evil and that darkness at bay. Not all of them pray. But for the many that do… their prayers are fierce. And often selfless. When they pray for safety… they are asking God to bring them home to their loved ones so that spouses aren’t widowed and children aren’t burying a parent. They are praying for the recovery of victims. They are praying for strength to get out of bed every day. To turn off the TV when the media paints them in a negative spotlight. When protestors demand the removal of “pigs” and “killers”. They are thanking God for the stranger who bought them a coffee or for the opportunity to have saved a life or even just touched one that day. They are asking for patience. For clarity. For support in the battle against the demons of post-traumatic stress that they and their brothers and sisters face. 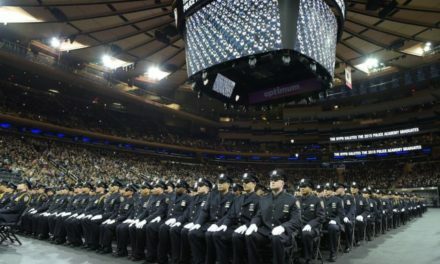 When someone who isn’t a police officer is in church, they have the luxury of focusing on the service. The music. The family. Our Sheepdog don’t have that luxury. Because they are often thinking about the unseen threat facing their parish. Their family. Their community. Yes, chances are the police officer that drives those police cruisers you’ve seen puts their trust in God. But there are no guarantees. And because there are no guarantees, perhaps it’s worth considering putting your own trust in God. After all, I’d rather put trust in God and end up being right when I die… then NOT put my trust in God and end up being wrong. Remember, Joe – you can always look the other way when you see something you think is wrong, like big scary words. But our officers will never look away when they see something they think is wrong… and neither will He. PreviousPro-Police Group Attacked By ANTIFA Trolls. Their Response Is Spectacular. NextThree Veterans Took Their Own Lives In 5 Days At VA Facilities. We Are Failing Them.